Of all the choices for home flooring, two offer unique characteristics to the homeowner – cork flooring and laminate flooring. They have several features in common, but the two are also different. We will discuss these differences below to help you decide if one of these is right for your home. Cork is made from a layer of the bark of the cork oak tree, Quercus suber, which is grown in Spain, Portugal, and Tunisia. 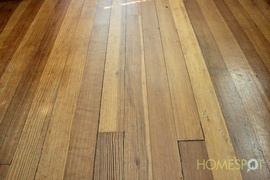 The cork interior of the flooring is sometimes covered by a cork veneer 1 that can offer the appearance of other materials such as bamboo or even marble, but usually, cork has a unique appearance. Because of this, cork does not provide the uniform look of laminate. The overall look of the floor will be varied and may not be to everyone’s taste. Cork is sold in planks and tiles. Laminate, on the other hand, is made from a combination of organic and inorganic materials. 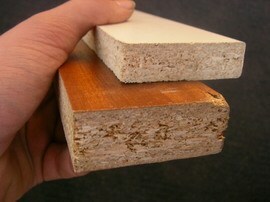 A bottom paper layer provides stability to the internal particle board 2 layers and the upper image of the desired wood species or stone type. On top is a clear finish that gives the material a durable surface. All of these layers are laminated together under pressure and heat to create the final material. Usually, laminate flooring comes in planks, but it is available in tiles as well. Cork is the softer surface for walking and standing. This is an advantage in the kitchen. Despite being installed on a pad 3, laminate is a hard surface that may not be comfortable to stand or walk on over time. 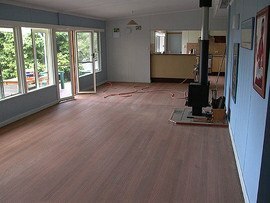 Moreover, flooring made of cork must be protected from direct sunlight, or the color will change. Laminate is not affected by sunlight. Both cork and laminate are relatively easy to install, making them favorites of DIY homeowners. However, both will have a better appearance with a professional installation. Either can be installed over existing hard floor surfaces, but the subfloor 4 should be clean and completely level to prevent bumps or pits in the finished flooring. This is especially true for cork flooring, which is not always installed over a pad 3. Cork is installed in one of three ways depending on the type purchased. 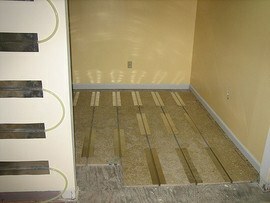 It can be glued to a subfloor 4, stapled to a subfloor 4, or, most often, installed as a floating floor like laminate. To install a floating floor, planks are snapped together over a pad 3 with space left at the edges of the room to allow the material to expand and contract. These spaces are covered by baseboards. One difference in the installation of cork and laminate is the need to seal the cork floor with a polyurethane coating. This is not necessary with a laminate floor. Because of this extra step, cork is the most difficult of the two installations. Cork is also the most expensive flooring material of the two, mainly because it is an imported material. The cost for cork ranges from $3 to $9 per square foot depending on the quality and type. Labor for professional installation will add $1.50 to $3 per square foot. For example, a living room that is 18 feet by 20 feet will cost approximately $1,400 for materials. Labor will cost about $600. The underlayment 5 will cost about $100 for a total cost of $2,100. Laminate ranges from $2 to $8 per square foot, plus the extra cost of the pad 3. The difference in price is determined by the thickness of the laminate material and quality of the finish. Labor for installing this floor will be about $1.50 to $3 per square foot. For example, a living room that is 18 feet by 20 feet will cost approximately $1,040 for materials. Labor will cost about $525. The underlayment 5 will cost about $100 for a total cost of $1,665. Both types of flooring stand up well to heavy traffic in the home. Neither stains easily, and regular dust mopping and occasional damp mopping is all that is required. Depending on the thickness of the cork installed, it can be sanded 6 past the sealant and small imperfections resealed. Laminate cannot be sanded 6 or refinished since it has a veneer 1 that cannot be reapplied. Once damaged, laminate can only be replaced and not repaired. Cork needs to be resealed with polyurethane about every five to ten years, especially in a kitchen, bath, or other area prone to wetness. Laminate never needs to be sealed. The sealant used on cork flooring and the quality of the application determine how well the floor resists moisture. No amount of sealant will protect cork from standing water or persistent, high humidity. Cork tiles or planks will curl and discolor if exposed to these hazards. Laminate flooring is particularly susceptible to water damage. Any standing moisture will cause the plank’s interior material to warp and the surface to discolor. Quality cork flooring usually comes with a 25-year warranty and will easily last that long if well maintained. Laminate has a longer lifespan, 30 years or more, with proper treatment and little maintenance. Cork is the softer flooring of the two. It will, therefore, dent more easily. However, since it is a resilient surface, the dents often disappear. Pet nails and grit on the floor will cause small scratches as well. However, the varied nature of the surface appearance hides scratches and small dents where the flooring does not spring back. Laminate flooring is harder and less forgiving. Scratches and dents will show more easily. Heavy or sharp items will cause gouges in either type of flooring, however. In addition, heavy furniture should not be set directly on cork as it will “sink” into the soft flooring. Coasters or wide pieces of wood should be used under furniture legs to prevent this. 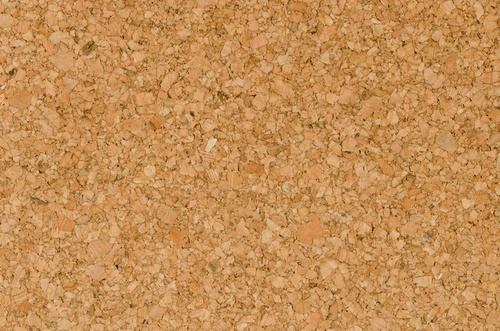 The naturally soft surface of cork is noise resistant and insulating. Laminate, on the other hand, often has an artificial sound when walked upon. 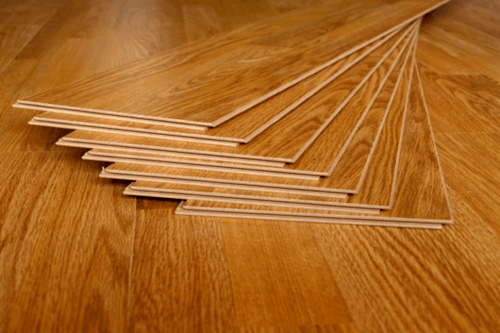 Some homeowners dislike the hollow or clicking sound that the floor makes. A professional installer can suggest a special type of acoustical underlayment 5 to prevent this. Both cork and laminate can be used with radiant floor heating 7. 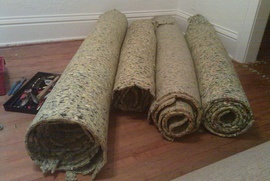 Either glue-down or floating floor installations will work well over radiant floor 7 mats. The greener choice is cork because it is a renewable and recyclable resource. The tree bark can be harvested every 9 to 13 years without harming the tree. Cork flooring is also hypoallergenic and antimicrobial, which inhibits the growth of microorganisms. In addition, cork has the reputation of being warmer on the feet in winter and cooler in summer because of its springy, cellular structure. The small air pockets in the flooring act as an insulator, keeping heat out in summer and retaining interior heat in winter. Cork is also resistant to insect infestations. The wood layers within laminate, however, can be inviting food for termites and carpenter ants. Because of cork’s unique look, it may or may not be a help with the sale of your house. It depends on the taste of the homebuyer. Laminate does not improve a home’s resale value. Even though it mimics the appearance of hardwood, most homebuyers do not prefer laminate flooring in a home they purchase. 2 Particle board: An engineered wood product used in construction projects and composed of wood chips, sawmill shavings, and/or sawdust and a suitable binding agent, such as resin. How much does it cost to install cork or laminate flooring in my city? Cost to install cork or laminate flooring varies greatly by region (and even by zip code). To get free estimates from local contractors, please indicate yours.